Home › Flooring › Is Bamboo Flooring Waterproof? Can I Put It In My Kitchen? Is Bamboo Flooring Waterproof? Can I Put It In My Kitchen? 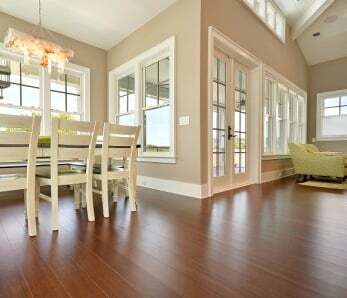 Hardwood and bamboo floors in the average home have a tough task at hand – not only must they resist damage, but they must do so while retaining their aesthetic qualities under punishing conditions. A key element of durability is water-resistance – especially important for high-moisture content rooms, like bathrooms, kitchens and utility spaces, in addition to front and back entrance areas where wet or muddy boots may traipse through. 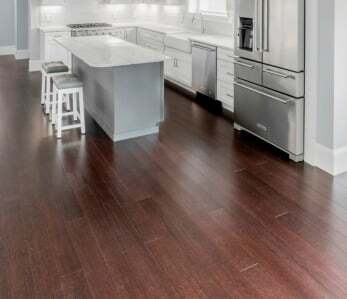 In this article, we explore whether is water resistant, and compare it to other forms of flooring options for your home. 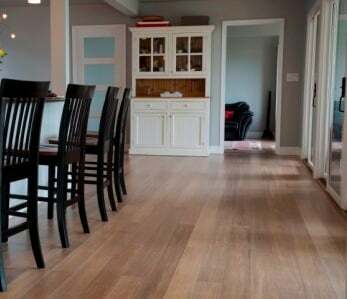 Strand bamboo flooring is typically more water-resistant than hardwoods, in fact if you get a high quality bamboo floor they will typically provide you with 24 hour spill protection in case of puddles. That being said – bamboo flooring is not waterproof, in fact no wood floor is waterproof. While bamboo is more resistant, it’s still a natural material, and as such the organic structure can give way to warping where there is excessive moisture. We define ‘excessive moisture’ as a puddle of water that is left on the surface of the flooring for extended periods of time (more than 20 hours), or a flood. It’s worth noting that under normal circumstances, bamboo is also a naturally hostile environment for mold – stifling and slowing its ability to grow. So, is bamboo flooring water-resistant? The answer is, mostly! 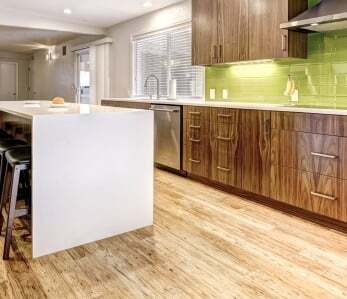 Can I use Bamboo Flooring in My Kitchen? 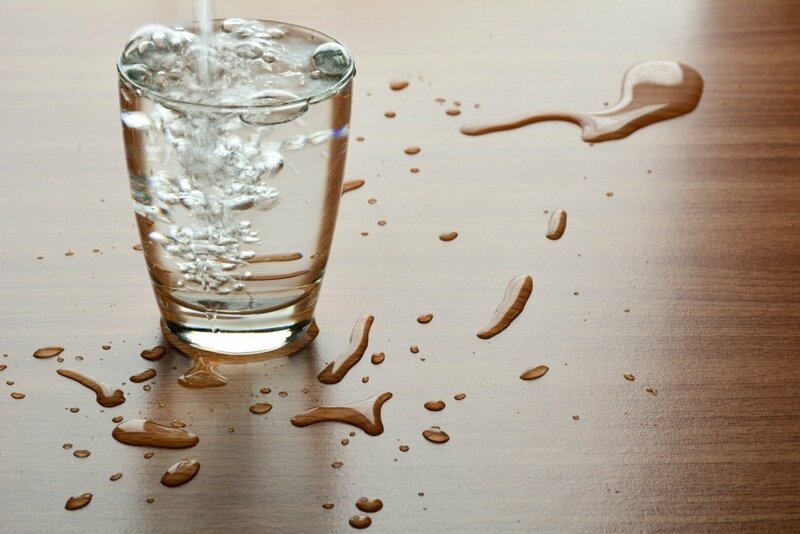 Yes – , as water droplets left on it will simply evaporate over time, with no harm to the floor itself. In fact, strand woven bamboo floors are great for kitchens because of their hardness (more than twice as hard as most hardwoods). This means that they look great in high traffic areas even after years of use. You’re probably aware bamboo is a form of grass – this is what provides it with heightened water resistance as compared to hardwood floors. Other hardwoods may be permanently damaged by excessive water, whereas strand woven bamboo will often retain it’s shape once it has dried out. Leaving a puddle of water on the surface of bamboo or hardwood may leave a mark if it is not cleaned up within 20 hours. 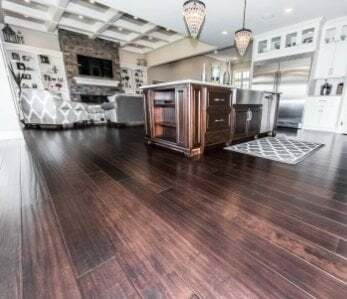 There are steps that you can take to improve water resistance of any hardwood floor (such as using special polyurethane sealers to coat the surface), but these are usually unnecessary with strand bamboo flooring due to it’s durability. May Your Cup Runneth Over. Just Not On Your Wood Floor. Can Bamboo Flooring Be Used In Bathrooms? 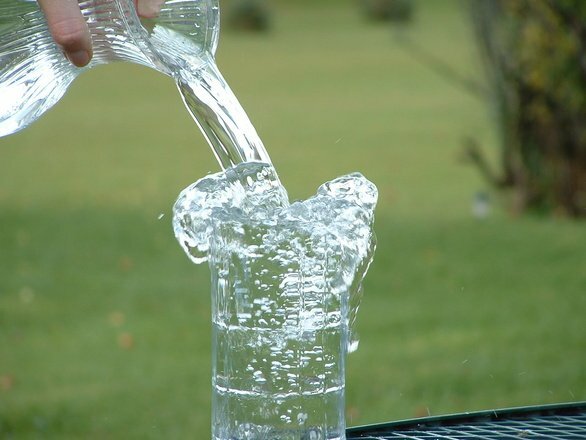 Can It Get Wet? Most hardwood floor manufacturers (including us) don’t provide a warranty on their products in full bathrooms. However, many of our clients install our floors in bathrooms, with no problem. As a general rule of thumb, if you frequently use the bathtub (like when bathing your children) and water spills over the tub or splashes in copious quantities, you probably want to avoid putting bamboo or hardwood flooring in the bathroom. On the other hand, if you just have a shower stall or you rarely use your tub, you can typically install a bamboo floor in a bathroom with zero problems, just make sure to place protective mats or rugs at the entrance to the bathtub. Some people ask so checkout our article ? As a flooring material, bamboo flooring is suitable in almost all rooms. Not only is it aesthetically pleasing and available in a wide array of grains, dyes and effects, it’s also durable and water-resistant – ensuring that your floors stand the heaviest of footfalls, beautifully, for the years to come. If all of this weren’t enough, bamboo flooring is also incredibly kind to the planet. An exceptional all-rounder and an excellent choice for beauty, practicality and green credentials. Very good information, we will install bamboo flooring in our open concept 1st floor, thanks.